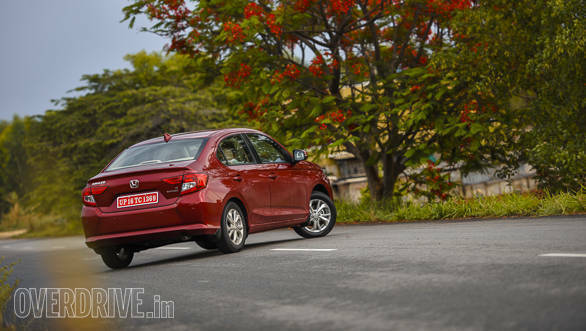 When the compact sedan segment was born a decade ago, we knew it wasn't just a flash in the pan. These cars distorted the idea of a sedan for many considering how manufacturers simply slapped a boot onto existing hatchbacks, though we knew the second generation onwards most would become full-fledged, cohesively designed cars. And that's exactly the case with the second generation Honda Amaze. The all-new Honda Amaze was first showcased at the 2018 Auto Expo, where it garnered attention for how radically different the design is from the previous generation Amaze. It also boasts higher equipment levels as Honda wants to offer a richer, more premium feel to the compact sedan buyer. 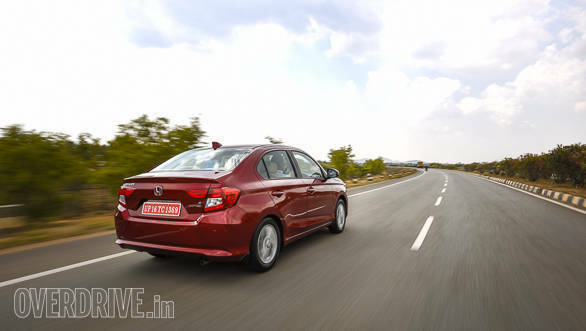 And while the previous generation Amaze was the first Honda to use a diesel engine in India, the second generation Amaze is the first diesel to come mated to a CVT. A quick spin behind the wheel of the petrol and diesel versions on the outskirts of Bengaluru helped us acquaint ourselves with the car. The design language is inspired from bigger cars like the Honda City and Civic, which makes for a more muscular stance and is in stark comparison to the older version's Brio-based front end. I wouldn't say the design is more modern, in fact there's a slightly retro feel to the face as the front end is flat and absolutely vertical. There's a hint some of the 1990's American muscle cars too, especially the way the headlights and front grille are styled. I personally like the way the face looks, though the design seems to have received mixed reviews. More importantly, as I mentioned above, the design is a lot more cohesive and one look at the new Amaze should tell you this isn't a cut-paste job. The way the roofline slopes and merges into the boot looks a lot more appealing thus, and you know Honda's designers have spent time perfecting this particular portion of the car, given that it has been an Achilles heel for the segment. The sides aren't as appealing, with just one crease at the shoulder, which makes the car look drab. The rear end looks good though and reminded me of the last generation City, particularly thanks to the bootlid's pronounced lip, C-shaped tail lights, the angle of the number plate and the rear bumper. On the whole, this is a well-designed car and I am glad to report that in terms of their design, compact sedans have come of age. Honda's conservative approach, particularly when it comes to equipment levels has seen buyers complain, but the new Amaze should change that. But first, let me tell you about the interior design. The dashboard looks clean, sans the busy-ness seen in a lot of new-age cars. It is a simple layout with a mix of matte black and piano-black plastics. The central air-conditioning vents sit at the top of the centre console, below which is the 7-inch touchscreen for the infotainment system (on offer only in the top, VX variant). The steering wheel is new and looks and feels nice with its revised controls. The seats and lower half of the cabin are beige-hued, making for a nice contrast with the black finish of the top half while also offering a roomy feel. A definite highlight inside is the amount of space you get courtesy the new chassis. Honda has spaced the front and rear wheels further apart from each other to increase the wheelbase by 65mm. The car is 5mm longer at 3995mm and 15mm wider at 1695mm which means there's more shoulder room, legroom and kneeroom and Honda says there's an additional 25mm of space between the front and rear seats. What's more, the new Honda Amaze gets a rear arm rest complete with two cup holders now, which adds to the car's premium feel as well as passenger comfort. Honda also tells us rear headroom has been increased, but at 5 feet, 11 inches I had my hair brushing against the roof which means six footers will not be comfortable. 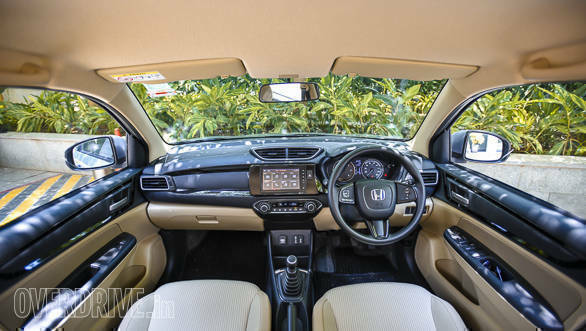 Honda also claims the air-conditioning system is more efficient thanks to the revised placement of the vents and a quicker cooling system, but temperatures in excess of 40 degree Celsius meant we did feel warm at the rear, especially since the Amaze does not get rear AC vents. 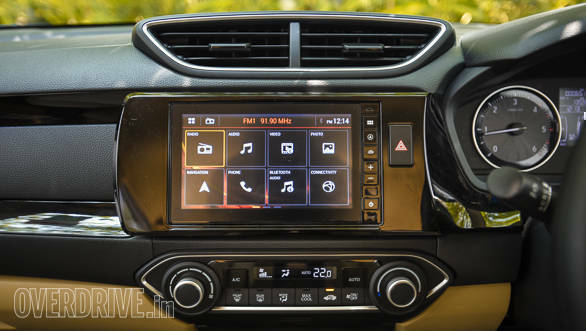 The VX variant offers Apple CarPlay and Android Auto connectivity via the touchscreen, which also integrates Wi-Fi to access navigation or browse the internet via your smartphone. The engines are perhaps the only bit carried over and the Amaze will continue using the same 1.2-litre, four-cylinder petrol offering 90PS and 110Nm and the 1.5-litre diesel offering 100PS and 200Nm with the manual transmission. The diesel engine offers a lower 80PS and 160Nm with the CVT though. The petrol engine remains unchanged while the diesel engine has received a raft of changes. Internals have been revised and there's new pistons, cylinder blocks, oil pumps and chain systems to reduce noise levels. There's better sound insulation as well, though I did find the diesel engine to sound clattery, especially in the automatic. ARAI certified fuel efficiency for the engines stands at 19.5kmpl for the petrol manual and 19kmpl for the petrol automatic. Claimed efficiency for the diesel is an extremely impressive 27.8kmpl, while the number for the diesel automatic stands at 23.8kmpl. The new CVT is very impressive  you barely feel the rubber band effect thanks to the seven steps on offer and I was also impressed with how quickly the gearbox responds to throttle inputs, in the petrol and diesel both. Even more impressive is the fact that you can barely tell the power deficit in the diesel automatic thanks to how efficient the CVT is in terms of sending power to the front wheels and the performance is effortless. The petrol automatic even manages to sound sporty and loves being revved, like most petrol engines from Honda. 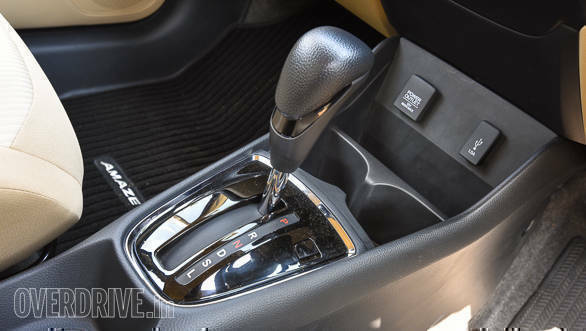 The petrol automatic comes equipped with paddle shifters which the diesel automatic does not, though it is the diesel that feels quicker and punchier on the road. As for the manuals, there's a likeable feel to the transmission, though the gear changes are accompanied by a very slight rubbery feel. The 1.5-litre oil burner feels as impressive as ever offering ample grunt even below the 2,000rpm mark. Both engines are tuned to offer strong bottom end and midrange grunt though top end performance has been compensated, considering that urban jungles will be the car's typical domain. The Amaze feels confident on the highway though and is well-mannered at high speeds, offering a planted feel even clipping at speeds. The steering wheel has a slightly delayed response dialed, though feedback offered is good. The steering feels heavy at crawling speeds though and I would have liked a lighter feel, especially when trying to park in cramped spaces. From behind the wheel the new Amaze is reasonably engaging to drive but not overly sporty and feels well-balanced considering the intended target audience. The new Amaze will be offered in four variants, E, S, V and VX. E and S use steel rims while V and VX sport 15-inch alloy wheels, though tyres are common at 175/65 section ones from Bridgestone. The suspension setup is on the softer side in the interest of offering a good ride quality and the new Amaze does impress with its plush ride. It soaks up bumps, potholes and tall speed breakers impressively, without a jarring effect. On the flip side, the soft setup results in some amount of body roll, though the roll is well-controlled. That said, the suspension setup should make the new Honda Amaze a comfortable car for driving long distances, especially given how comfortable and plush the seats are. The seats are soft and let you sink in and feel good instantly and add to the car's likeable feel. I am also impressed with the amount of space the rear seat offers and in fact I had Rohit drive while I sat at the back and felt very comfortable. 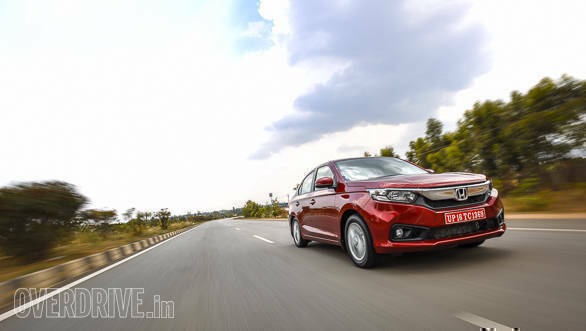 The 2018 Honda Amaze is clearly a massive step-up from the first generation car in every respect. The car looks a lot more appealing than outgoing version, while the interiors have been spruced up to challenge its updated rivals like the Maruti DZire, Hyundai Xcent, Volkswagen Ameo and Tata Zest. The feature list is a lot more comprehensive now, which adds further to the car's likeable feel and Honda is clear about wanting a larger share of the lucrative pie that the compact sedan segment is even today, a decade after it was born. The new Amaze will be launched in the second week of May and while it will be priced competitively, expect it to also command a premium over its predecessor. 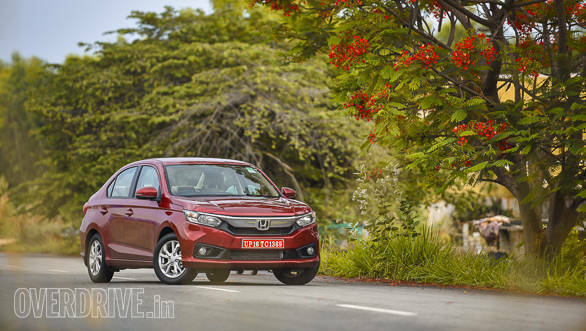 All said and done, the 2018 Honda Amaze does have the firepower to do well in what is easily the most important car segments in the country.